Nurture Rights, which owns The World of Dinosaur Roar!, the popular licensed property created by Peter Curtis that teaches pre-schoolers about dinosaurs, has announced the award of a global licence to games company Winning Moves to produce a World of Dinosaur Roar! version of one of its best-known games. Winning Moves will be launching The World of Dinosaur Roar! Top Trumps card game in Spring / Summer 2018. The game will be widely available at high street, department store and supermarket retail, as well as online. The core market for the game is expected to be pre-school children and families, but dinosaur fans of all ages will also love this new version of Top Trumps. The Top Trumps cards will feature the brand’s colourful dinosaur characters but will also include facts and figures about each dinosaur, verified by Professor Paul Barrett of the Department of Earth Sciences at London’s Natural History Museum. In the longer term the property may appear in board game format as well: Winning Moves also has the rights to other board game versions of The World of Dinosaur Roar! The agreement was developed and finalised by licensing agent Bulldog Licensing, one of the industry’s leading licensing agencies, on behalf of property owner Nurture Rights. Inspired by Dinosaur Roar! the best-selling, classic picture book from the 1990s that is also owned by Nurture Rights The World of Dinosaur Roar! began life as a book series that introduces readers to a different title character in each book and uses his or her personality to teach children about dinosaurs in an engaging and entertaining way. The first four titles in the series of The World of Dinosaur Roar! Books: Dinosaur Roar! The Tyrannosaurus rex, Dinosaur Boo! The Deinonychus, Dinosaur Stomp! The Triceratops and Dinosaur Munch! The Diplodocus are already hugely popular with readers throughout the UK. Many more colourful dinosaurs, including Dinosaur Snap! The Spinosaurus, Dinosaur Flap! The Oviraptor, and Dinosaur Whack! The Stegosaurus, are on their way. The World of Dinosaur Roar! is produced in association with the Natural History Museum in London. 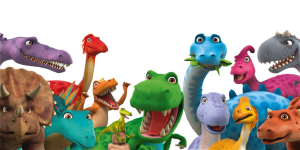 With its large cast of memorable characters and engrossing storylines, The World of Dinosaur Roar! is already attracting licensee interest as a property with potential across a wide range of categories and merchandise aimed at a core market of children aged 2-5, as well as gift givers and dinosaur fans everywhere. With Golden Bear on board as master toy partner, set to launch a major range of product for autumn 2018, Macmillan Children’s Books the official publishing partner for the property, and this latest agreement with Winning Moves, licensing agents Bulldog Licensing are set to make a number of partner announcements for this popular brand.